For the souls who thirst for the Truth, God offers as a guide Saint Dominic, and the great lights of his order. The Truth, loved and taught, has its justifications in and draws its strength from the Faith and at the Holy Sacrifice of the Mass and Catholic Tradition; herein lies all our work: in the service of the Church for the glory of God and the salvation of souls. It is not we who sanctify; it is Jesus present in the Holy Eucharist. It is He who leads souls to God and attracts them to the Truth. The diligent service of the divine Truth leads the teaching Dominican Sisters near the Altar. Holy Communion is her great strength: it gives God Himself. The Sisters will find in contemplation and in their rapport with God, the light the wisdom and the inspiration they will need to reach the spirits, the hearts and the wills of the children who will trust them. At her entrance, the postulant takes a class ensuring a service close to the children, so that one may be able to judge her aptitudes for teaching and education. This period of probation ends by the taking of the habit and the entrance to the novitiate. 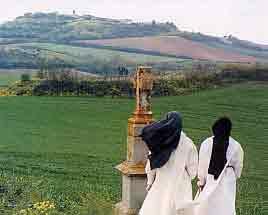 As directed by Canon Law, during the first year the novice receives a religious formation under the direction of the Novice Mistress who begins it in the light of the Constitutions of her future mission. By the reading of the Holy Scripture, doctrinal study and contact with the best authors, her spirituality deepens in a way that is very Dominican. An initiation to liturgy and Gregorian Chant permits her to unite herself more vitally to the mysteries celebrated each day. The domestic services to which she is applied exclusively prepare her for those that she will continue to assume as educator with children. In the course of the second year of the novitiate, the Sister resumes teaching while continuing her formation. She can then be permitted to make her temporary profession, renewable annually, until her final vows at the end of five years. During the first two years, helped and guided in her work by the Mother Mistress of studying Sisters, she benefits from a religious formation and secular formation in the light of the great principles of Saint Thomas. Having tasted and understood the importance for herself and for her mission of this known and loved truth, she will have the desire to deepen it during her whole life. At a time of obvious spiritual misery and intellectual poverty perhaps worse yet because not recognized, the Sisters are consecrated to remedy the distress of the century by the Christian school, in bringing to the souls of children “the mercy of Truth”. Such is our pride and Christian honor: “To desire above all the place of Love, of Truth, of the Sacraments in the life of our children.” (R. P. de Chivre, O. P.) Everyday the children, if they wish, assist at Mass and at the Rosary. In every class, from the first to the last, three hours weekly are reserved to the study of doctrine. At this time, the children learn catechism, are initiated to the reading of Holy Scripture, to the examination of the mysteries of our Faith, and to the practice of the Sacraments. The large feasts are likewise prepared together before being celebrated in the chapel whenever the liturgical calendar coincides with the course of the school year. What meaning does theoretical teaching of doctrine have, in effect, that has no application to daily life? To transmit knowledge is not all, it is also necessary to educate in teaching and to give solid criteria for discernment. That is why we have chosen a decidedly literary formation. The classical sections indeed offer to the young girls in our schools a much stronger formation and prepare them for their future missions as Christian women and mothers. Under pain of making of these freedoms miserable paths leading into evil, which is what we witness too often, we prefer to adapt a discipline of life that takes into account circumstances and souls. Above all, we take into account the personal relationship of each one with Our Lord. The work of education does not end at the door of the classroom. In a family atmosphere, we ask them to take part with us in daily tasks, and thus to acquire traditional female skills. The management of a dormitory, the decoration of the classroom, also offers the opportunity to form the tastes of our students to a sense of simple and unadorned beauty. And, above all, we try to fashion our girls after the model of Her in whom rests the eternal grandeur of a woman —the Virgin Mary. At present (November 1999), our community is composed of 138 nuns (of whom 6 are deceased), dispersed over 7 schools. Six of these houses of education are situated in France, one is located in United States, and the last has been established in Kernabat (Brittany, France) in 1996. A total of 950 pupils are educated in our establishments. Meanwhile the Mother House of Fanjeaux continues to shelter the Mother General and the Novitiate, which now contains 15 novices and 4 postulants.